We often learn more from failures than successes, this exercise is one of those opportunities. An online poster tried to validate his newly purchased MFJ-918 by measuring Insertion VSWR. That is done preferably by measuring a good termination (dummy load) to validate that it has a very low VSWR, then inserting the Device Under Test (DUT) and measuring the VSWR as a result of insertion of the DUT. The poster did not mention measurement of the dummy load alone, and it is a type that warrants validation. Above is the poster’s test setup, his Rigexpert AA-170 is connected to the balun’s input jack using a M-M adapter. The output wires on the balun form a rough circle of about 550mm perimeter by eye. Above, the Insertion VSWR doesn’t look too good and you might understand him wanting a refund… but is the test valid? One expert opined Sometimes you get what you pay for . Above is his measured R,X (ignore the |Z| curve, it is there mainly for hams who don’t understand the nature of Z). Note that X increases fairly linearly from 1MHz to about 24MHz where it flattens out and turns downwards. The latter is evidence of self resonance, so lets play it simple and focus on the behaviour well before self resonance has an effect. Lets take 15.5MHz where by eye, X looks like 48Ω. If that was caused simply by a series inductance, the inductance L=Xl/(2πf)=48/(2*π*15.5e6)=0.49µH. Now if we calculate the inductance of a circle of 2mm diameter wire with perimeter of 550mm, we get 0.50µH, which suggests the cause of the R,X response and associated Insertion VSWR. The dimensions used are guessed from the pics. If the instrument had no error, the reading at 1MHz suggests that the dummy load is a bit below 50Ω at that frequency… but it should be swept before making measurements with it. There is every appearance that the test is invalidated by long connecting wires to the dummy load, and that the dummy load is of unknown quality. keep test leads and connectors short, prove the fixture by exploring sensitivity to dimensional changes. 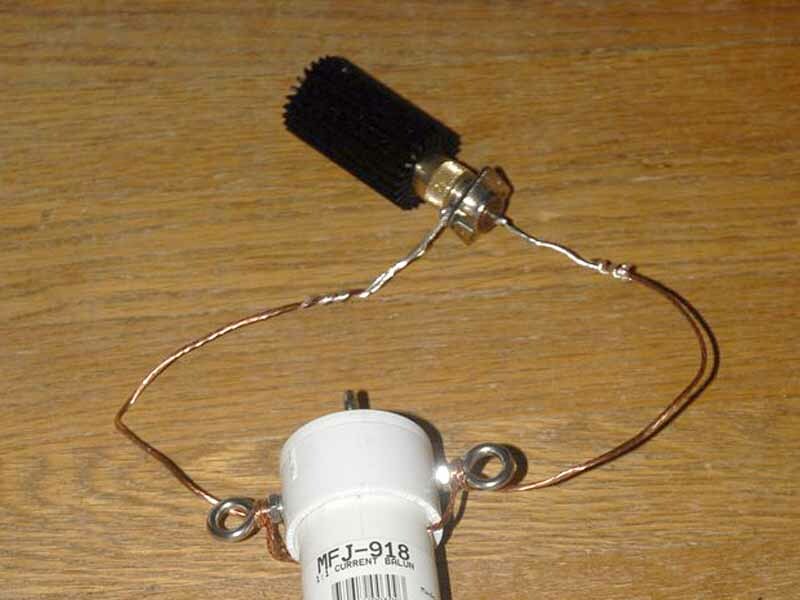 Watch the blog for continuing postings in the series Exploiting your antenna analyser. See also Exploiting your antenna analyser – contents.